Презентация к уроку английского языка "The blue planet.Crystal-clear wonder"
Цель урока: коммуникативно-речевое развитие учащихся через обобщение знаний по теме «Save the Earth.The blue planet». Создание условий для совершенствования лексических навыков говорения; для формирования УУД обучающихся. Формирование и развитие коммуникативных умений учащихся на основе языковых, лингвострановедческих и социокультурных знаний, навыков. Совершенствовать навыки поискового и изучающего чтения. Формировать и развивать у учащихся межкультурную компетенцию; расширить лингвистический кругозор; способствовать развитию творческой деятельности учащихся. Развивать познавательные умения: задавать и отвечать на вопросы, искать нужную информацию, рассуждать, обосновывать, доказывать. Развивать познавательный интерес к стране изучаемого языка, формировать устойчивую мотивацию к изучению английского языка. Планируемый результат: Умение правильно понимать значение лексических единиц (ЛЕ) по теме, использовать ЛЕ в заданной ситуации. Умение передавать основное содержание прочитанного текста с опорой на текст/ключевые слова/план/вопросы. Ю.Е.Ваулина, Д.Дули, О.Е.Подоляко, В.Эванс «Spotlight 7», серия «Английский в фокусе». Рабочая тетрадь к учебнику, раздаточный материал. Оснащение урока: компьютер, магнитофон, интерактивная доска, доска. Teacher: Good morning! Sit down, please. I am very glad to see you and hope that you are ready for the lesson and you are in a good mood. Teacher: I want to begin our lesson with a short film «Introduction to…». Watch this film and try to tell the theme of our lesson. Teacher: Let’s answer the question from the film. You are right .Our task today is to talk about water resources and learn to value water as a precious natural resource. The theme is “Crystal-clear wonder “and today we‘ll talk about the variety of water wildlife and about water as the source of life on the planet. We have just seen the film and it is not by chance. The reason why we have chosen the topic «Crystal-clear wonder» is quiet vivid. Why is it important to save water? Water is essential for all life on Earth. We need it for drinking and washing, for producing food products, for medicine, for providing power, for controlling fire. We enjoy having rest at the seaside. So the need for clear water is huge. Let’s recollect the words and word expressions related to this problem. 1. Complete the statements. There is an odd word for each statement. 4. Water can be taken from …. and rivers. 5. Water can….ice at low temperature. 3. Match the words and use them to complete the sentences. 1…….is very harmful to the environment. 2. A lot of…….is dumped into this river. 5. Many…..are in danger of dying out. 7. How can I avoid breathing……from cars cycling in the city? Teacher: Well, let’s start our discussion. I believe, all of you know that 70% of the Earth is covered by seawater and a further 3% by ice, neither of these are easily turned into water that can be used. Less than 1% of the Earth’s total resources contain water for drinking, farming or industry. There is no exact data on how many people in the world can get drinking water, but it is said that 1,3 billion people cannot. 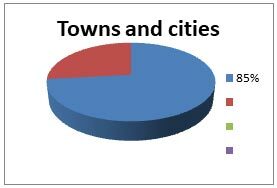 The problem is much worse in villages than in towns. For example, 85% of towns and cities worldwide are provided with safe water compared to65% of countryside areas. 100% of the population of USA and Europe drink safe water, only 75% of Indians and 28% of those who live in Kenya can drink water without a health risk. Cross the odd one out. 1. lake, river, drink, sea..
2. sparkling, skating, driving, sailing. 3. beautiful, handsome, mineral, attractive. 4. fog, hail, water, cloud. There is hardly a person who has never drunk sparkling mineral water. Of course you can drink mineral water right from a spring running somewhere in the Caucasus, but most people buy it from shops on their way to a gym or to work, while having a walk or coming back home. Have you ever thought how the water comes to your home? Let’s listen to some pupils, look at the diagram of sparkling mineral water production and fill in the gaps in the text with the right words. Teacher: Are there any places in the world where there’s a lot of clean drinking water? Pupil: Sure. There’s no other country in the world that has as much high quality natural drinking water as Russia. You may have heard of Lake Baikal. It has one fifth of the total global fresh water resources and half of the global drinking water resources. Dive into deep. Read the text and complete the sentences.Ex.3 p.47. Are you tired? Let’s relax. Listen to the song and write down how rich marine life is. Why is it important to save water? Water is necessary for life. All organisms contain it, some drink it and some live in it. Plants and animals require water that is moderately pure, and they cannot survive, if water contains toxic chemicals or harmful microorganisms. Water pollution kills large quantity of fish, birds, and other animals, in some cases killing everything in an affected area. Pollution makes streams, lakes, and coastal waters unpleasant to swim in or to have a rest. Fish and shellfish harvested from polluted waters may be unsafe to eat. Let’s watch the film “Save water-save life”. 1. Tick the words you hear in exercise above. Water pollution, foreign languages, funniest movie, I don’t know what I can do, turn off the tap, types of music, watch science fiction, use water wisely, clean out a river, planting trees, don’t throw litter into lakes, see famous landmark, negatively affect our health, go to the seaside, save our planet from disaster, go sunbathing. How can we prevent water pollution? What can we do to keep the water clean? Work in groups. Let’s organize an Eco-helpers group. Write a list of activities for the group. Is your neighbourhood neat or tidy? A neighbourhood is a place where people live together. Every neighbourhood is special to the people who live there, so it is important to keep it neat and tidy. Read the questionnaire and circle the right answer for you. Describe your neighourhood to the class. When did you last participate in cleaning up your neighbourhood? What must/mustn’t we do to keep it neat and tidy? Water is a liquid for life. You could live for a month without food, but you would be dead after a week without water! So let’s conclude. What have we done today? Was it interesting and useful for you? It’s time we finish our work. You’ve worked hard. I am satisfied with your work. I give excellent marks to…, good marks to…Our lesson is over. See you later. Goodbye.